Biography of French Renaissance & Mannerist Sculptor. also known as The Three Graces. One of the finest French Renaissance sculptors, Germain Pilon excelled as a medallist and portrait sculptor. He produced various types of sculpture, including bronze, marble, terracotta and wood. He was influenced by the Fontainebleau School in France, as well as Italian Renaissance sculpture and sixteenth century Italian Mannerism. Along with Jean Goujon (active 1540-63), Pilon is considered one of the most important French sculptors of the cinquecento (16th century). His most famous surviving works are the sculpture of Three Graces holding the heart of Henry II of France (1561, Louvre) and the Tomb of Catherine de Medici and Henry II (1563-70, Abbey Church, Saint-Denis). His works can also be seen in some of the best art museums in Europe. Born in 1529, Pilon's father was a sculptor with his own workshop and it assumed this is where the young Pilon received his early training. Together, they may have worked on sculptures at Solesmes Abbey (Solesmes, France) before returning to Paris in 1550. Pilon went on to apprentice with Pierre Bontemps (1507-68), the famous French Renaissance artist famous for his funeral monuments. Pilon excelled in all fields, drawing as well as sculpture. By 1555 he was providing models for Parisian goldsmiths. His early works were influenced by Renaissance art from Italy, especially those of Michelangelo, but out of this, his works moved towards Mannerism - favouring intensity and ambiguity. His figures were elongated and had exaggerated poses. His work developed mid-career and became even more realistic, displaying theatrical emotion. 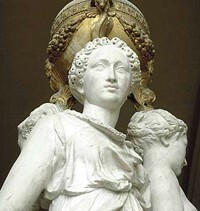 Pilon's first and most famous marble sculpture is the monument Heart of Henri II (1561, Louvre, also known as The Three Graces). Although he was still young, the fact that he was entrusted with such an important commission, shows that he was already considered in high regard. The group statue consists of three graces, holding an urn over their head. Executed from a single block of marble, the delicate and graceful sculpture is an outstanding piece of art, blending the best of French and Italian sculptural influences. Commissioned by Queen Catherine in 1561 to honour her late husband, Henry II who had died after being wounded in a tournament in 1559. It was also intended to receive the Queen's heart on her death. The Three Graces recall a cassolette designed for Francis I by Raphael and engraved by Marcantonio Raimondi. The light tunics, the elegance and gestures, the serenity of their faces all are refernces to antique statuary. However Pilon 'modernised' the sculpture by adapting Mannerism's elongated slender figures. The artist carved deep into the marble, so that the drapery catches the light, suggesting real movement. The beauty of the group is completed by the very fine craftsmanship. To learn how to judge artists like the Mannerist sculptor Germain Pilon, see: How to Appreciate Sculpture. For later works, please see: How to Appreciate Modern Sculpture. Pilon's next important commission was a mausoleum requested by Catherine de Medici for herself, her husband (Henry II) and their children. Begun in the early 1560's, the marble mausoleum was built at the Abbey Church, Saint-Denis. Francesco Primaticcio (1504-1570) designed the work and Pilon carried out the sculptures. The kneeling effigies of Henry and Catherine on the upper tier of the tomb are cast in bronze, although the primary material used is marble. This terracotta figure of the stricken Virgin was intended for the Mausoleum commissioned by Catherine de Medici. The expressive nature of the Virgin shows signs of a late French Gothic revival. A monument to Chancelor René de Biraghe. The kneeling, naturalistic figure was considered highly innovative in its time. The bronze relief 'Deposition' which belongs to the tomb of René de Biraghe. Contains strong influences of Michelangelo and his school. Pilon died in 1590. His emotional style of art is thought by some to have been too personal to inspire imitation. Nevertheless, his works represent an important step towards greater naturalism and were to influence French Baroque artists in later generations.